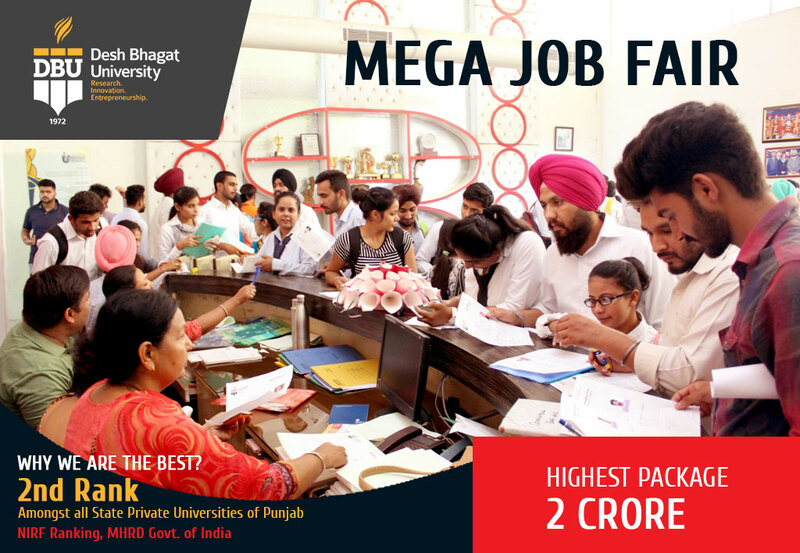 Desh Bhagat University, Best Private university in Punjab (2nd Rank, NIRF - MHRD Govt. of India) organized a Mega Job Fair, ‘Visionzz-18’ at its campus. The fair was targeted at the students who are Graduate, Post Graduate in various streams like Management, Marketing, Hotel Management, Engineering, Business Administration, Computer Applications, Ayurveda, Agriculture, Nursing and Pharmacy etc. 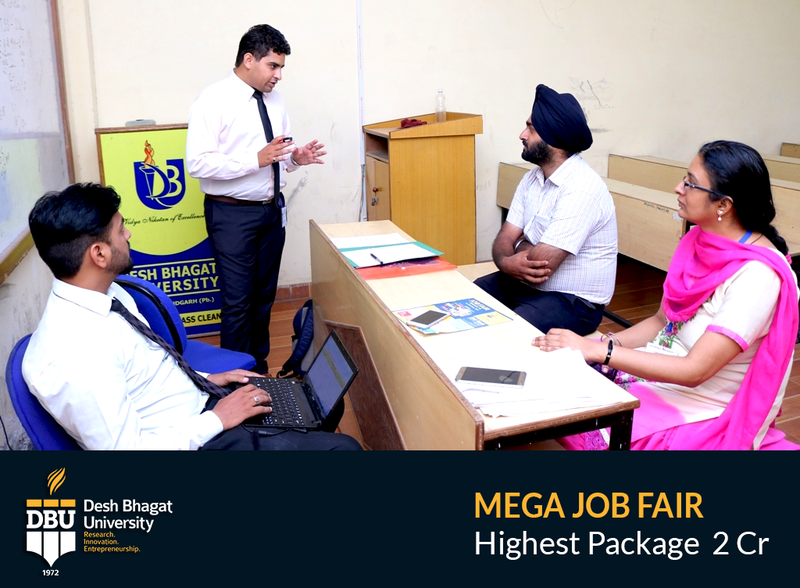 While infogiving details, University Chancellor Dr. Zora Singh said that the Mega Job Fair was organized in the fond memory of his father Sr. Lal Singh Ji, a renowned Freedom Fighter and an associate of Neta Ji Subhash Chandra Bose, who envisioned the need of educated successful & holistic youth in India. We cherish his dreams & try to transform the society. In this Mega Event more than 22 well-known National and Multinational companies including Equity Score, Reliance JIO, Touch Stone, IVY Hospital, Acc Limited, Willowood Crop, Competent Synergy, Key Hotels, RNG Group, Blue Chip Tech India, Pix India Pvt. Limited, Hotel Kama, Arora Iron & Steel Rolling Mill etc. participated. Officers of these companies selected suitable candidates for different jobs. The Fair was attended by a large number of job aspirants from different parts of Punjab and nearby states. The event received huge success as more than 295 candidates were selected through written test and personal interview by different companies and 3 students got job offer of package 2 CR. Dr. Singh congratulated these students and advised them to work with full dedication and prove assets for the organizations in which they are going to start a new phase of life. University Pro Chancellor Dr. Tajinder Kaur and Vice-chancellor Dr. Virinder Singh wished the selected students bright careers and said that as a part of corporate social responsibility, the university has been organizing such job fairs on regular basis for providing suitable employment opportunities to candidates, not only for its own students but for the students of the whole North India. They hoped that this job fair will prove a blessing for the students who participated in it. Desh Bhagat United Vice-President Er. Sandeep Singh said that the University organises such Mega Fairs from time to time and this is the 18th Mega Fair to be organised. The fair provided an opportunity to deserving students to get jobs in companies of national as well as international repute. 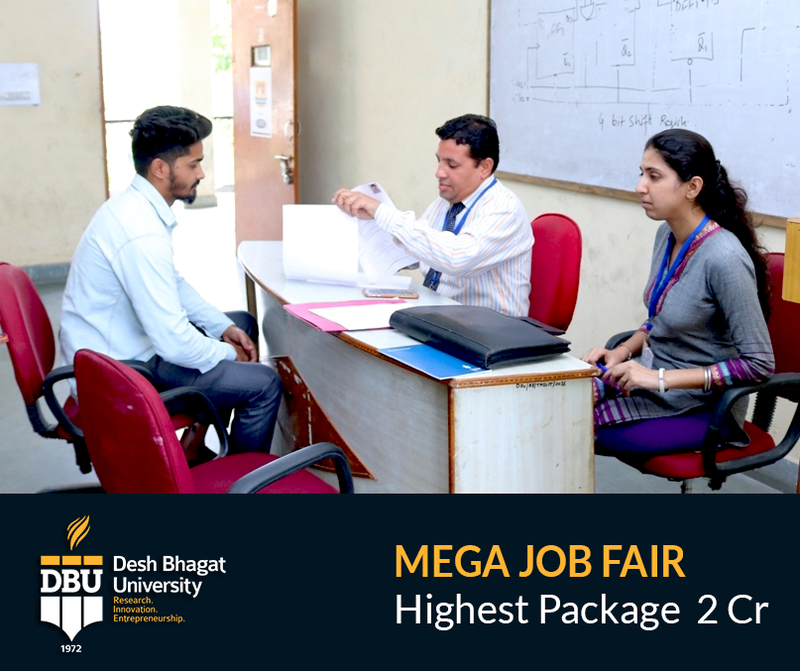 Selected students appreciated the efforts of Desh Bhagat University, ranked in top two private universities in punjab as they felt that they could have never got such a job through their own resources. They also said that the event was very well - organized.